That Pink Floyd crop top is awesome, not that I could carry off a crop top, but I think you NEED it and should wear it for the both of us! the jouer foundation truly is amazing! I definitely want to try that Jouer Tint as well, looks amazing! I really to try the Revlon Lacquers too! The Matte ones don't really do it for me but the lacquers look beauuutiful! I'm still waiting to find a perfect red lippy which 1) stays on and 2) doesn't look stupid on me.. tempted to give the Revlon ones a go! i can't believe that bubble blush is by guerlain... it's so not.. guerlain! i always associate the brand with more mature, feminine packaging, but that blush is so cute and innocent! :) i agree that online window shopping is therapeutic - i've been eyeing the NARS eyeshadow base and creamy concealer. i think i'll pick those up really soon. i'm also lusting over some Korean brand lip glosses, but i really need to stop buying lip products! I adore the London Grammar album too, it's so soothing! Some great choices! Love the Jouer moisture tint line! Those prints are so beautiful. I'm a sucker for literary things. I have to immediately go raid this new found etsy store!! I just got three Revlon Matte Balms and they are so lovely! I really would love to get my hands on some Jouer and Guerlain products! Those prints are awesome! I wish I had the space to hang them. 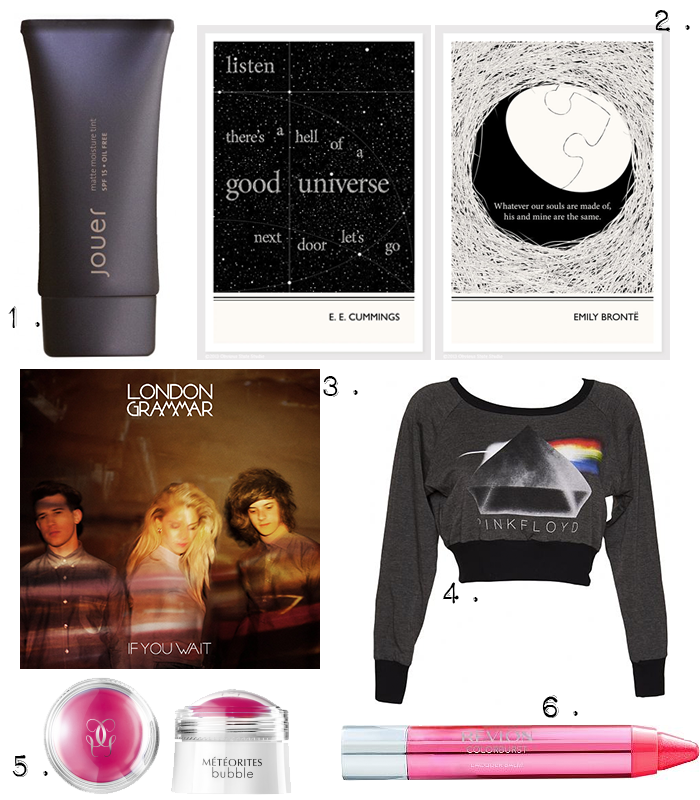 What a lovely little edit - both beauty products are gorgeous and I love that pink Floyd sweater! London Grammar are amazing, such beautiful music - this is a lovely edit! Those prints are amazing! And I love that they are literature related. They'll be great book covers too!